Got in, put on our exercise shoes, and took a fast walk around the Jardin du Luxembourg. Sweated out all the kinks from the flight. Walked by La Mediterranee and realized we hadn’t had dinner there in a while so made reservations, came back to the room and crashed. Best naps ever are jetlag naps. No nonsense, no tossing and turning. One minute you are there and the next, bam, it’s an hour later and you have drool all over your face. Or maybe that’s just me. Good nap, though. Dinner was perfect. La Mediterranee is a fish restaurant up the street from our hotel. They really get the lighting thing right — the shades are a warm orangey color and everything, food and people, has a rosy glow. Especially the radishes! 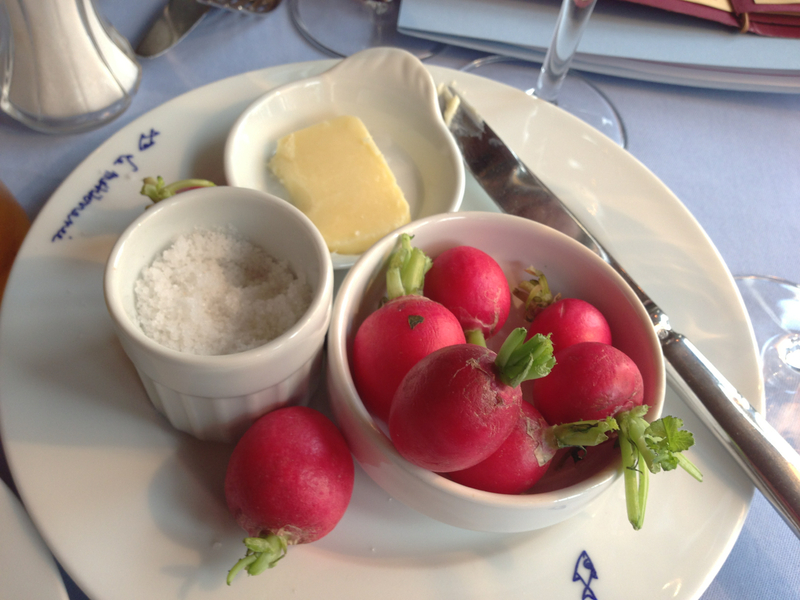 The first thing they do is set a dish of red, crisp, juicy radishes on the table. With a smear of sweet creamy butter and a sprinkling of crunchy sea salt, they are superb. Honestly, why don’t American radishes taste like that? Because they never do. For dinner I started with a sea bass carpaccio with mustard seeds — brilliant! Served with a grilled sandwich garnish filled with concentrated sweet tomato. Jerry had crisp calamari with dressed mesclun. My entree was monkfish medallions with tapenade, roasted tomatoes, and what they called fregola sarda but what wasn’t like any fregola sarda I’ve ever had. More like some kind of gnocchi or spaetzle where a flour dough is forced through a sieve into a pot of boiling, salted water. Whatever it was, yum. It was great, the monkfish was perfectly cooked, and the whole thing came together like a dream. Jerry had bouillabaisse, which he loves. This was a great one, too. We both scored big. Only I had dessert, though I shared. Lemon tart covered with fraise de bois. Lovely. Sauntered over to the Pont des Arts. 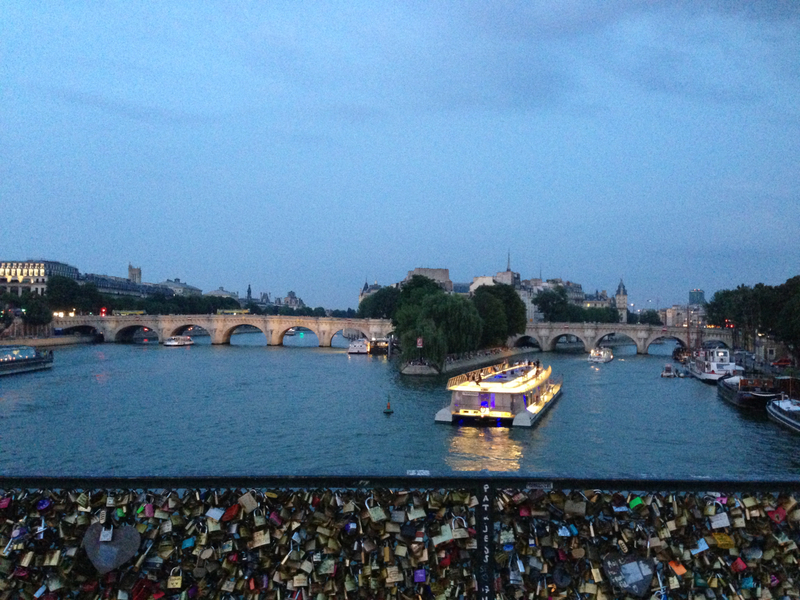 The railings of that bridge are now almost covered with lovers’ locks, which glittered and twinkled in the setting sun. The lights of the city came on, a band playing on the bridge had a crowd of kids dancing. Everyone was happy, and so were we. Went back to the room and ate one of the koignettes we’d bought earlier at Maiaon Laricol. If a food experience can be orgasmic, that one was. All butter and crunch and salted caramel — I sounded like Meg Ryan in that scene from When Harry Met Sally. You’d have wanted what I was having! And then to sleep. A perfect day.